Night crawlers, sometimes called earthworms, and bloodworms are easily distinguished by even the untrained based on their characteristics. 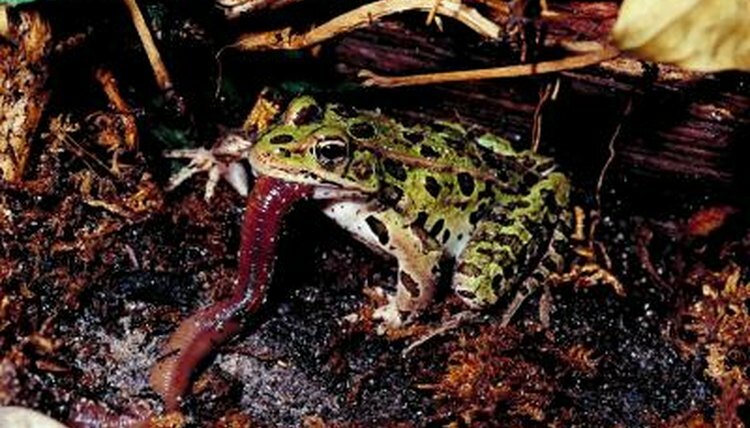 While both are grown and sold commercially as bait, they are actually very unique worms with very few things in common, including where they live and eat, how they look and how they produce offspring. Night crawlers are earthworms that get their name from their tendency to feed during the night. Night crawlers are large, segmented worms reaching up to 10 inches in length. They have a round, dark-colored head and a flattened tail. The smooth, slimy skin of the night crawler is covered with setae, or tiny bristles. The bristles help the worms burrow deep into the ground. Night crawlers have no teeth and feed off of compost and debris, such as rotting leaves, by absorbing the nutrients through their skin. Bloodworms are larvae of a fly closely related to the mosquito. They are named for their bright red color created by hemoglobin, the same material that carries oxygen in human blood. It also allows bloodworms to live in stagnate water that has a low oxygen level. They burrow deep into the mud along the water’s edge. Unlike night crawlers, bloodworms have teeth. With proper nutrition, bloodworms may reach up to 15 inches long. Each night crawler has both male and female organs, but two must mate to produce young. When breeding, the worms wiggle close to each other and each worm deposits sperm into the other. Each worm then lays a capsule full of eggs. On the other hand, bloodworms are either male or female and they breed when the males release sperm on top of the water and the females burst open and dispense eggs. After mating, the male and female bloodworms die. Both worms are raised and sold commercially. Night crawlers are the bait of choice for freshwater fishermen. Crappie, bass, catfish and bluegill all are drawn to a hook baited with a night crawler. Bloodworms are used in saltwater fishing to catch spot, white perch, croaker and striped bass. Some anglers choose not to use live bloodworms though, because when sticking them they bleed and can bite with their fierce teeth. Frozen bloodworms are also sold in pet stores for use in home aquariums.